For the past few years, my brother, Axel, has given me a $20 Starbucks gift card for Christmas. This Christmas, my sister, Dovima, also gave me a $20 Starbucks gift card. Add this $40 in Starbucks gift cards to the $3.59 unused portion of the Starbucks gift card I received from Axel in 2009, and it becomes apparent that I am either Mormon or a lifelong tea drinker. 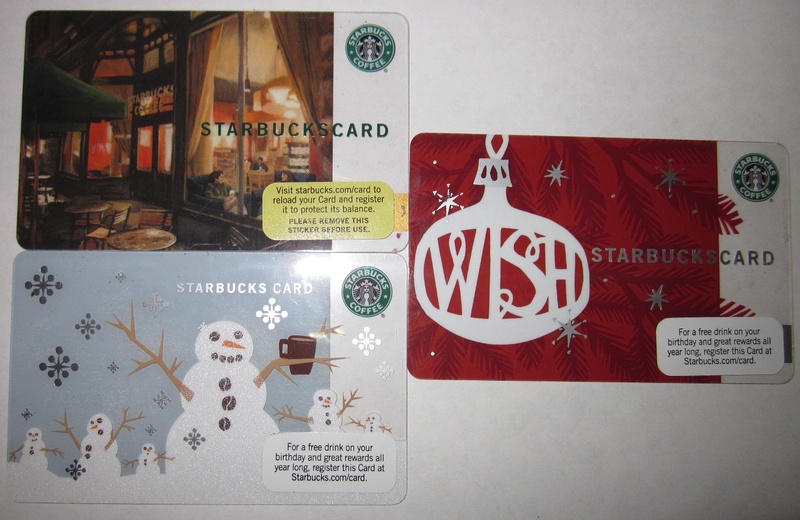 $43.59 Starbucks gift card collection. In actuality I am a tea-loving atheist, and tea is not Starbucks’ signature beverage. In fact, Starbucks hot tea tastes rather anemic to me, but that could have been due to it being so hot, I scalded both my tongue and esophagus with such severity I lost my ability to distinguish flavor for three days. Before my lactose intolerance started registering on the Richter scale, I guzzled many a Frappuccino as well as an occasional latte, but my all-time favorite Starbucks’ beverage was their peppermint hot chocolate topped with whipped cream and drizzled with chocolate. According to my gastroenterologist, this combination of milk, chocolate, and peppermint is the perfect Bermuda Triangle for someone with guts as fragile as mine, so I’ve quit the Frappuccinos and lattes. Now, when I think of it, I order the less lethal soy hot chocolate, but since I still have $43.59 in Starbucks gift card credit, this idea has yet to catapult to the forefront of my thoughts. As for Starbucks new lightning fast pay via smart phone technology that launches today, that’s a great rush hour gimick. Every time I visit any Starbucks in Manhattan, it’s during the off-peak period so waiting an eternity to pay is not an issue. What remains an issue is the indecisive customers ahead of me or the barista that transparently hates his or her job. Both are institutions that remain intact. A few weeks ago, on a Saturday night, Milton and I went to a Starbucks on Columbus Avenue. There were only a few customers ahead of us, and they knew what they wanted. The person working the register efficiently swiped my gift card. The problem was the lackluster barista. If this guy had been a car, he would have been a Yugo stuck in second gear – and that was before he mumbled he was out of ice and traveled to Antarctica to replenish the supply. He disappeared for fifteen minutes. Since he was the only one making drinks, there were easily a dozen customers waiting for him to return. Considering that it was 17-degrees and there was a mountain of snow outside, possibly this was the barista’s way of delivering a statement to the icy beverage buyer, a bubbly young woman who weighed about as much as my thumb. My thumb ready for its close up. Me: Where’s my hot chocolate with whipped cream? Milton was denied his drizzle of chocolate over his whipped cream in response to that outburst, but my brother footed our tab so my friend did not complain. Since my career overseeing tile labeling merely pays health insurance and a potato, I can only afford a dumb phone, I have a two year supply of Starbucks gift card credit, and I would sooner belly slide naked on hot coals than visit Starbucks at peak hour. Paying via smart phone does not impact me, but if it did, I don’t see much advantage to paying quickly if the goods are not delivered quicker. Even if Starbucks employed baristas on speed, there’s no way they’ll ever eliminate the indecisive customer who is standing at the register holding up the line. If futurists (a modern name for the they say-ers?) are right and a time comes when paying via cash or credit card is rendered obsolete, the wallet will be replaced by the smart phone, laptops by tablet computers, and obesity eliminated by eat-as-much-of-anything-as-you-want-and-stay-thin pills (the biggest pharmaceutical cash cow this side of Viagra), I am sure that subway commuters will still carry bulky bags and backpacks as they sip their Starbucks during rush hour and the steady decline in the quality of life will continue no matter how fast we pay to get caffeinated. This entry was posted in Humor and tagged coffee, smart phone, starbucks, the new york times. Bookmark the permalink. Ahhhh give me the days in little ole New York when you could go to the corner coffee shop run by locals with actual NYC accents and the only chain coffee chain was the wonderful Chock Full Of Nuts that Heavenly coffee, better coffee a millionaire’s money can’t buy! Also their pound cake was super duper! And even the old Woolworths on 23rd Street served egg creams at their lunch counter!